In Hebrew, English and Yiddish, this legendary Israeli singer has created an unparalleled body of music. Reprinted with permission of the author from the June/July 2002 edition of Hadassah Magazine. She’s a tiny woman with a big guitar and a voice so warm and mellow it wraps itself around you like a hug. And Chava Alberstein, one of Israel’s best-loved singers, does it in three languages–Hebrew, English and now, more than ever, Yiddish. “We must all…believe in…a devil down below [or] a good Lord up above,” she belts out to a rollicking klezmer tune. Then, turning from faith to romance, with a snappy rhythm she explains why a girl must have two boyfriends: one to go to war, the other to devote his life to her. Leaving the old chestnuts behind, Alberstein has set modern Yiddish poems to her own melodies. The tunes are close enough to traditional ones so they don’t jar, yet different enough so they burst with life, though often tinged with sorrow. The deceptively sweet song, “Mayn Shvester Khaye,” tells of the poet who still writes in Yiddish for the sake of his sister, Khaye, murdered in Treblinka. It was Joan Baez, Pete Seeger, and The Weavers who first inspired Alberstein, back in the ’60s, to make Yiddish her signature. She was attracted by the content of their music: prisoners, railways, struggle. “In Hebrew there weren’t any songs like that, about real life,” Alberstein explains. “The Hebrew songs were more romantic.” Then her father, a music teacher, brought home some booklets of Yiddish songs, which had traditionally been performed by cantors. Alberstein gave them a new twist–“I sang them as I heard Pete Seeger and Joan Baez sing in English”–accompanying herself on guitar. Since then she has cut more than 40 albums in Hebrew, six of which have been awarded the Kinor David prize, Israel’s Grammy; six albums in Yiddish; and an album of English standards, from George Gershwin to John Lennon. Recently, Alberstein has returned to Yiddish with renewed vigor. “It’s a miracle that at the end of the millennium [I could record] 15 new songs in Yiddish,” the musician says of The Well, which she cut in 1998 with the Klezmatics, the avant-garde New York klezmer group. So enthusiastic has the response been to these songs in concert, in the United States and in Europe, that Alberstein has recorded another all-Yiddish album and included five Yiddish songs on her latest album, Foreign Letters. Yiddish songs featured, too, in a recent PBS special of her in concert in Berlin. So why this emphasis now? It began with what she saw as payment of a debt to her roots. It turned into the sheer joy of creative renewal. She had just scripted the 1999 documentary film Too Early To Be Quiet, Too Late To Sing, directed by her husband, filmmaker Nadav Levitan, and her daughter, Meira, 30, about a small group of Yiddish poets who had survived World War II. Alberstein was born in Szczecin, Poland, and arrived in Israel with her family at the age of 4. Her memories of the early years mirror those of the hundreds of thousands of immigrants who poured into the young state. For the first few weeks the family lived in a tent and for the next year in a tin hut, in the transit camp known as Sha’ar Ha’aliya (The Gateway to Aliya). The lack of privacy and hodgepodge of languages are immortalized in her Hebrew song “Sharaliya,” pronounced just as the immigrants corrupted the name of the camp. For an interview on her own turf–at home in Ramat Hasharon, an upscale suburb of Tel Aviv–Alberstein appears to be totally natural, her wavy blond hair pulled back in a ponytail. Padding around the simply furnished apartment in slippers, she hums to herself as she prepares coffee. Her mother, she says, used to sing to herself in a warm soprano. Surprisingly, Alberstein describes herself as intensely shy and “not social.” Yet she creates an easy intimacy, speaking freely about her life and art, anecdote after anecdote tumbling out. She can create this intimacy on stage, too, because she is a consummate actress, says Israel Radio program editor Gilead Ben-Shach, a keen Alberstein-watcher and longtime fan. Then would come the catcalls. “It was physically scary, a struggle for survival,” she says. Gradually she learned how to control the crowd; then she’d squeeze in a Yiddish song. Since her army days, Alberstein has sung every kind of music, Israeli and foreign, from folk to pop to rock, even children’s songs. Critics have compared her to Edith Piaf, Judy Collins, and Joan Baez. 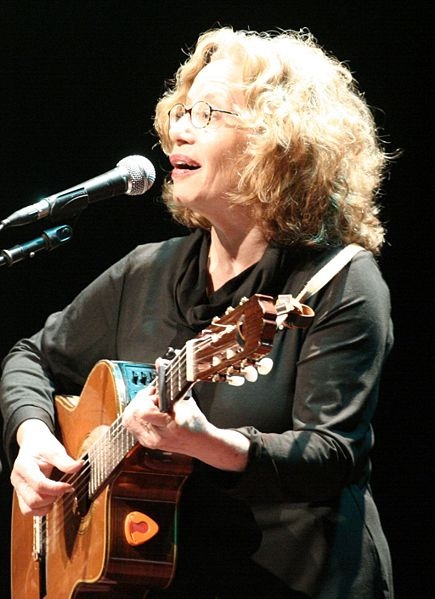 For Israelis, she has always been an icon, singing the innocent and romantic Zionist and land of Israel songs; poems by the most famous Hebrew writers, like Leah Goldberg, Yehuda Amichai, T. Carmi and Zelda; and songs written especially for her by the country’s leading lyricists. “I admire her for her choice of songs,” Ben-Shach says. “The texts are rich with meaning.” According to Ben-Schach, Alberstein also has an uncanny sense of what will work for her, collaborating with lyricists and composers. “She knows what to ask for,” he says. And, like many Israelis, he believes Alberstein will best be remembered for her land of Israel songs. The angry response followed quickly: Curses and threats came over the phone. A music-store owner in Beersheba told Alberstein he had dumped all her records out of his store. Then the Israel Broadcasting Authority banned the song. And although then attorney general Yosef Harish declared the ban an “unjustifiable violation of free expression,” the song has hardly been played since. Some have tagged her a “protest” singer. She, however, prefers to be known as a singer who values content, whether personal or political, and it is this that attracts her fans both young and old, even when they find her politics distasteful. There have been hard times in Alberstein’s career, when her creative juices seemed to run dry. Each of these periods has marked a significant turn and a renewal. One summer, encouraged by her husband, she recorded the English album The Man I Love, with her brother accompanying her on clarinet. Also, with her husband’s encouragement, she tried acting, appearing in two of his films on kibbutz life. Now, while Mizrahi (Israelis of Sephardic and North African background) singers are reviving and renewing their parents’ lost culture–which they had been told was “primitive” and worthless–Alberstein is drawing again on her immigrant roots, creating the music of maturity, knowing that one’s parents’ culture will die with them unless they are given a voice. If Yiddish was once considered a sign of weakness, the language of those who had gone to their deaths like sheep to the slaughter, Alberstein has made it a sign of strength, of the power to bring the dead back to life. Pronounced: ki (short i)-BOOTZ (oo as in book), Origin: Hebrew, a collectively owned and run community in Israel. Pronounced: meez-RAH-khee, Origin: Hebrew for Eastern, used to describe Jews of Middle Eastern descent, such as Jews from Iraq and Syria. Pronounced: yuh-HOO-dah or yuh-hoo-DAH (oo as in boot), Origin: Hebrew, Judah, one of Joseph’s brothers in the Torah. The unlikely history of a Hasidic melody. Music has been a part of Jewish life since biblical times, and remains integral to the Jewish religious and cultural experiences. Learn the most popular songs associated with the day of rest.